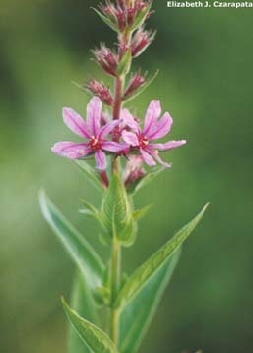 Wetland perennial, 3’-7’ tall, with up to 50 stems topped with purple flower spikes. One main leader stem, but many side branches often make the plant look bushy. Clipped plants grow back, and cut stems readily re-root in soil to produce new plants. Many areas of the state use safe biocontrol beetles that feed on the loosestrife to keep it in check and allow other plants to grow.